Global oil benchmarks are suddenly heading in different directions, upending what have consistently been close linkages between prices in various parts of the world. To be sure, oil prices have declined everywhere over the past week on news that OPEC and Russia might agree to lift production levels. But regional differences are wreaking havoc on the oil market, dragging down some benchmark contracts more than others. Western Canada Select (WCS), for instance, consistently trades at a discount to WTI, but the spread has widened recently. On May 23, WCS traded $17 per barrel lower than WTI, which is, to be sure, a very large discount. However, WCS has plunged this week, and by May 31 the Canadian heavy oil benchmark was trading at $41 per barrel, or $25 below WTI. Pipelines are full and the bottleneck in Alberta is weighing on the Canadian benchmark. This has pushed Prime Minister Justin Trudeau to extreme lengths to get the Trans Mountain pipeline expansion built. But, the ceiling on midstream capacity is expected to persist, perhaps for several more years. For the last few weeks, Midland WTI has traded at a double-digit discount relative to WTI in Houston or Cushing. No new pipeline capacity is imminent, and in fact, the shortfall could grow over the next year. While the Midland discount is around $10 per barrel now, futures for November 2018 has Midland trading at a $17-per-barrel discount, a reflection of the fact that the pipeline bottleneck will only grow worse over the course of this year. WTI, for its part, is trading at a multi-year low relative to Brent. As of May 31, WTI was down below $67 per barrel during midday trading, dropping to an $11-per-barrel discount relative to Brent. Again the blowout in the spread is the result of surging shale production at a time when supply is restricted elsewhere in the world. Brent, meanwhile, has lost ground relative to the Dubai benchmark. This is the result of tighter supplies in the Middle East, which has pushed up prices. Not only is OPEC keeping supply off of the market, reducing flows, but the scrapping of the Iran nuclear deal has also raised fears of supply outages from the Middle East. The discount for Dubai relative to Brent has shrunk to less than $3 per barrel, the lowest spread in months. Obviously, American crude priced at more than $10 per barrel below oil found elsewhere in the world makes it highly attractive to buyers. That should result in an explosion in U.S. crude oil exports in the coming weeks. Export levels have already been trending up for the past year, but the price differential is now at its highest level in more than three years, likely sparking a stampede of purchases from Asian buyers, for example. Bloomberg reports that refiners in South Korea, India, Thailand, China and Japan are scrambling to buy up as much U.S. shale oil as possible from where they can get it, including from the Eagle Ford, the Bakken and the Permian. Interestingly, Chinese buyers are cut purchases from Saudi Arabia for the second consecutive month, swapping them out with more American cargoes. Why buy oil from the Middle East for $10-per-barrel more than from the U.S.? It is often said that the oil market is global, that oil is a “fungible” commodity, meaning that prices are largely the same everywhere. There are always regional discrepancies, but as a general rule, oil is globally priced. However, infrastructure bottlenecks, geopolitical fears, supply increases and outages are cropping up in various parts of the world, leading to an unusual divergence in the top benchmarks. With many of those factors not set to immediately go away, the price differentials may not dissipate anytime soon. 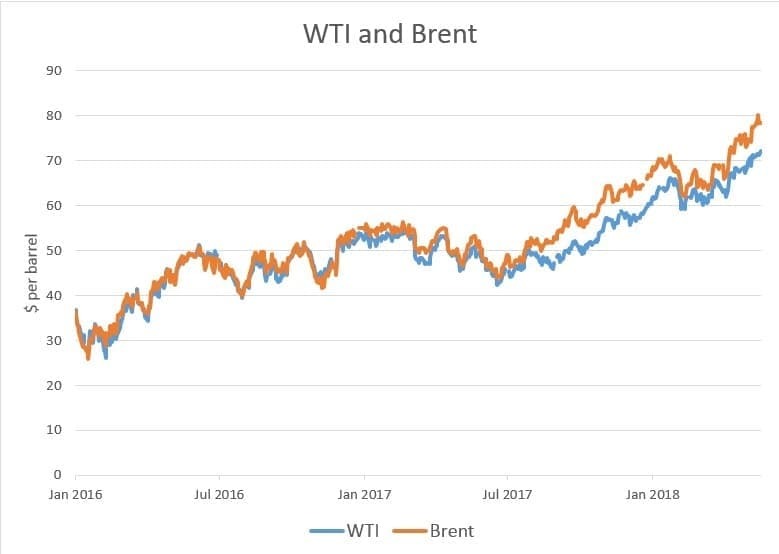 With all due respects to the author, regarding why WTI is $10 cheaper than Brent, I am very surprised to read his final conclusion that: " oil is a “fungible” commodity, meaning that prices are largely the same everywhere". No oil is created equal, oil at different location is of very different viscosity, that is why you have the price of Brent and WTI, followed by so many prices for different grades of crude oil around the world. Bottlenecks is one of the reasons why WTI is cheaper than Brent, the other very important reason the mainstream experts are so ignorant of is: Refineries need heavy oil to produce the full spectrum of fuel products ( not only gasoline but also middle molecule distillate, diesel and jet fuel ), WTI light sweet, especially shale super light sweet crude is of too short molecule crude to be refined for middle molecule fuels. What we are short of stock is not gasoline but diesel&jet fuel and other fuels, that is why Brent heavy oil is in higher demand, refineries paying $10 more to obtain limited secure supply. It does not matter how cheap US oil is, Chinese refineries will still desperately need heavy Saudi oil to produce the fuels they need, Saudis know that and they will not drop their price because they know US oil has little commercial value. We had no major onshore discoveries last 20 years for Brent type heavy crude oil, shale super light sweet has a lot less utility value to most refineries as the reason explained above. The bigger story is -25.9 million barrels of oil taken out of the S.P.R. over the last year. Nobody has got the guts to write a article/report about it. Well that's the story repeated everywhere, and like all the stories repeated everywhere, figures don't add up. The US oil Exports should rise from 1.67 Mbpd in april to 2.3 Mbpd in may, and more in june. The increase of US oil production will be of 144000bpd, the Iranian lowered their production by only 100000 bpd, and russia didn't respect their "contract" with the OPEC by a respectable amount of few hundreds thousands bpd. Demand for Saudi oil will be lower. Adding and substracting, this lead to a WTI rising instead of falling. The reason is certainly speculation, "screw the weak" as they say. The US consume about 19.5 Mbpd and produce 10.5 Mbpd, which means they are still net importers. If they can't export their oil, they will consume their cheap oil and import less which should put pressure on foreign oil. If you look at charts, the spread widened from 9 to 11 yesterday in 4 hours. I don't think US production increased that much in 4 hours. Which should mean that about $700 000 000 changed from WTI to Brent. Ok Futures operate with a leverage, but it applied on almost all futures at the same time. It's clear manipulation. even as we are now exporting 2 million barrels of oil per day, twice as much as a year ago, we are still importing an average of 8 million barrels per day to meet our needs....if there was that much of an oversupply of crude in the US, we would certainly be reducing our oil imports, instead of continuing to import at the same pace, wouldn't you think? it's almost as if someone is fixing the price so that we get screwed on every barrel, but who could that be?